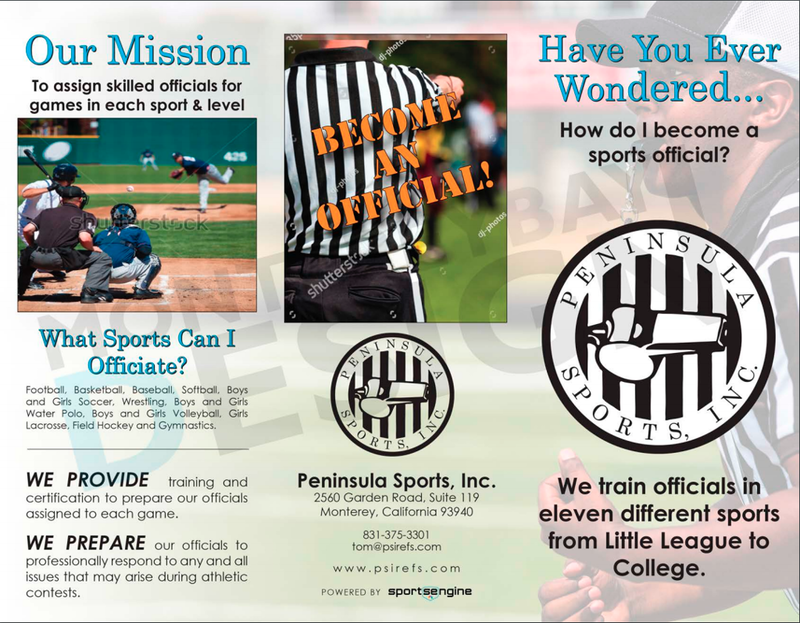 Peninsula Sports Incorporated (PSI) is always seeking both experienced officials and newer officials to develop. Becoming an official is not difficult. You are required to learn and understand how to apply specific High School rules and show confidence and composure while making accurate decisions. You will work cooperatively with fellow officials while managing players, coaches and the event. PSI provides on-going training to officials in preparation to confidently approach the challenges they face as an official. PSI provides scheduled payments electronically using ArbiterPay. PSI's experienced officials are interested in working together with you if you are teachable, and eager to learn. We strive to maintain a firm, fair and positive approach to officiating in cooperation with all scholastic sports participants involved. Please follow these instructions to join PSI now. Either click the big red REGISTER button above or (click on this hypertext link) to visit the Arbiter Sports Registration Dashboard , and complete the registration process to enroll in the sport or sports that you are interested in officiating. Enter the information requested to create your new account in ArbiterSports.com. Your game assignments and payments are made online through ArbiterSports. You must acknowledge that you understand and agree to the terms of the Independent Contractor Agreement, which defines your working status (you are NOT an employee of Peninsula Sports, Inc ). We ask for your prior experience and if you are associated with any school or organization that may create a conflict of interest if you were assigned to work with them. The final step: please make a payment (credit or debit card) to NFHS (National Federation of State High School Associations) for $17. This fee covers insurance and access to the Central Hub - Learning Center. After completing step 1, you will receive a welcome email that from ArbiterSports.com to either activate your new account or connect with PSI Arbiter Group 101440 if you already have an Arbiter account. At thia point, you will be able to log-in and verify (or update) your personal information. You must enter your calendar availability (the dates and times you are open to work games) as well as mileage limits using the "Blocking" feature on the left-hand side of your schedule page in Arbiter. The "Support" tab provides you with several articles to guide you through the process of blocking dates, teams, sites and navigating through the website to find the information you need to work your assigned games. Each sport has a page on this psirefs.com website. You will find contact information for the Trainer and Assigner of each sport and contact them. On each sports page of our PSI website you will find a training meeting schedule. Please attend the first meeting for your sport (or sports) and as many others as possible. The meetings are used to distribute needed information to all officials, to train new officials, and to provide "refresher training" to returning officials. PSI Annual Dues covers all sports from June 1st to May 31st of of next year. Dues payments cover costs associated with training, meetings and assigning games to officials. The Annual Dues of either $65 check payable to PSI, or $60 cash may be submitted by mail or at a meeting. Pre-Season meetings are mandatory for officials working the sport to get to know the assignors, educational chair and leadership committee members while receiving all the updates of Rules, Policy and Procedures, and Directives and Training of NFHS, CCS and PSI. Before your first on-court or on-field appearance at a training scrimmage or actual game or match, you must acquire the necessary uniform and accessories for officiating your sport. 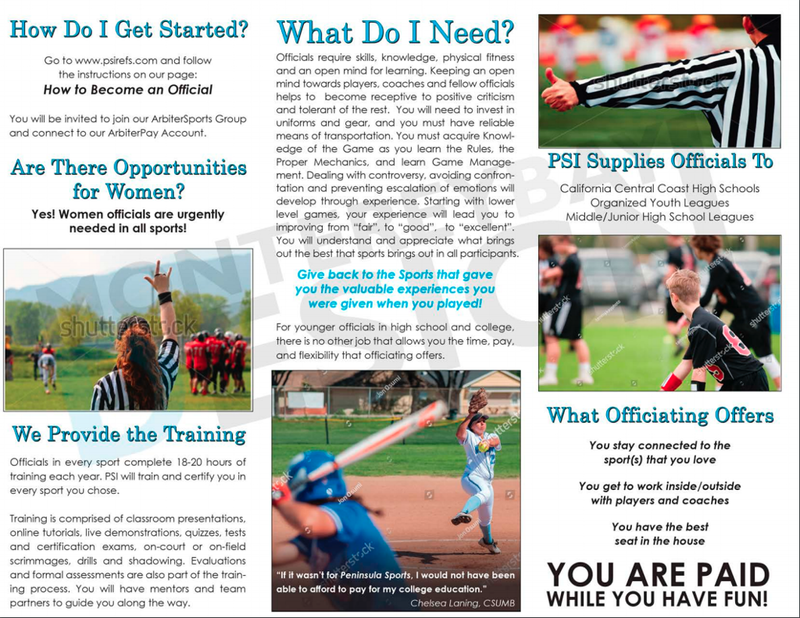 PSI will provide new officials with a list of necessary uniform and materials required to officiate your sport and assist in every way possible to purchase or obtain these items via a list of vendors or suppliers. Training involves reading the rule book, casebook, and/or manual for your sport, attending our training meetings, attending on-court or on-field scrimmages scheduled in the preseason, and taking a rules test for the sport. You will then be notified of assignments through your Arbiter Sports account before/during and after these pre-season trainings. New officials are paired up with experienced members to provide guidance and instruction throughout your career. As you gain knowledge and experience, you will do the same for others. Successful officiating is always a team effort. Before the end of the first pay period, open an account with ArbiterPay.com. ArbiterPay is used to transfer your payroll amount from Peninsula Sports directly into any checking or savings accounts that you select. There is an option for receiving a check or a debit card. More information can be found by clicking the "Payroll and Mileage" link on the left. If you have an ArbiterPay account already, make sure you are "connected" to Arbiter Group # 101440, so that your transfer will get to your account from the PSI account. RECRUITMENT: Officials who recruit newcomers into Peninsula Sports receive a recruitment bonus of $150. Details of this program can be obtained from Peninsula Sports staff. Use the Referee Referral Form to submit your referral to PSI Office. Additional information for referees can be found in Referee Magazine and on their website. August 23, 2016 - I am a sophomore in college and this upcoming season marks my fourth year officiating. I absolutely love it. Officiating provides a perfect transition for players who are not going to continue their career in high school, college, or beyond; allowing you to stay in the game (and get paid for doing so). I played girls lacrosse for five years in high school, but I became a men’s lacrosse official which puts me into an unusual situation of being completely new to the sport I officiate. While I love the men’s game and have had mentors push me to excel in the game, I lack a players experience on the field which can be a huge advantage. But now that I am in the game, I have endless opportunities to stay a part of it. I had the opportunity to officiate with a gentleman from Minnesota this past season who said he had been officiating for 41 years. 41 YEARS. If you truly love officiating and you stay in shape, there is no reason to abandon the game you love. My least favorite thing is getting yelled at. When coaches, parents, and fans critique your every move, the field can become a very uncomfortable place. This might be the championship game or the cross town rivalry. The tensions run high and the pressure mounts as you are forced to operate at the very best of your ability. As uncomfortable as it is, I know that the field is the most stressful workplace I will ever experience. If I can excel on the field, I can do anything. Dealing with pressure to excel on the field translates easily to dealing with stressful situations in the professional world. All of my mentors have stressed and reiterated that calm communication is vital to effectively managing the game. Coaches have run off the sidelines to yell and scream at the officials. As an official, you can’t just run and hide, you need to step up and learn how to deal with the noise and chaos and still remain in control. Clear communication often diffuses tense situations and keeps everyone calm. But even if no one is yelling, learning how to both connect with the players and coaches but maintain professional distance is critical to managing the game. In the professional world, communication and interpersonal skills consistently rank on the top 10 skills employers look for in a candidate. If you can capitalize on your on-field experience and learn how to communicate effectively while officiating, you are well on your way to professional success. Most officials don’t officiate full time, instead they are doctors, lawyers, business men and women – anyone can be an official (with the proper training and certification). As a college student who is constantly on the lookout for ways to transition smoothly from the academic world to the professional one, I see my fellow officials as valuable resources and connections. If I have made a good impression as a hardworking partner or trainee, that speaks volumes to my partner and establishes my reputation on and off the field. I consider every game I officiate to be an opportunity to build my reputation and to make connections. 5. Officiating requires quick, on-your-feet thinking. As an official, you do not have the luxury of time. Everything is happening at once and in a split second, you need to recognize fouls, identify the rule, correctly administer the penalty, and get the game going again. I have dealt with plays involving multiple penalties and changes in possession and I don’t have the opportunity to stand there, count on my fingers and figure out what happened. It is one of the biggest moments in a game where everyone is watching the official instead of the players. You must learn how to act and react in the moment and stay professional while doing so. The ability to adapt in an ever fluctuating environment is not limited to officiating, but it is essential for operating in the professional world as well. Ability to handle responsibility? Detail oriented? Ability to react quickly? Check, check, check. I have gone through multiple interviews in which the interviewer was more interested in my officiating experience than my seemingly more applicable professional experience. It doesn’t matter what profession you want to pursue when you graduate, officiating perfects so many different skills that you would be hard pressed to find a field in which your experiences were not relevant. In the organizations I have worked for, I get to pick the days I am available and my travel limits, allowing me to focus on my academic schedule first. And I definitely don’t complain about the pay. Being an official is hard work, but the pay certainly beats whatever you would get at the restaurant down the road busing tables. I am immensely thankful for the opportunities that officiating has provided and I look forward to many more years as an official. 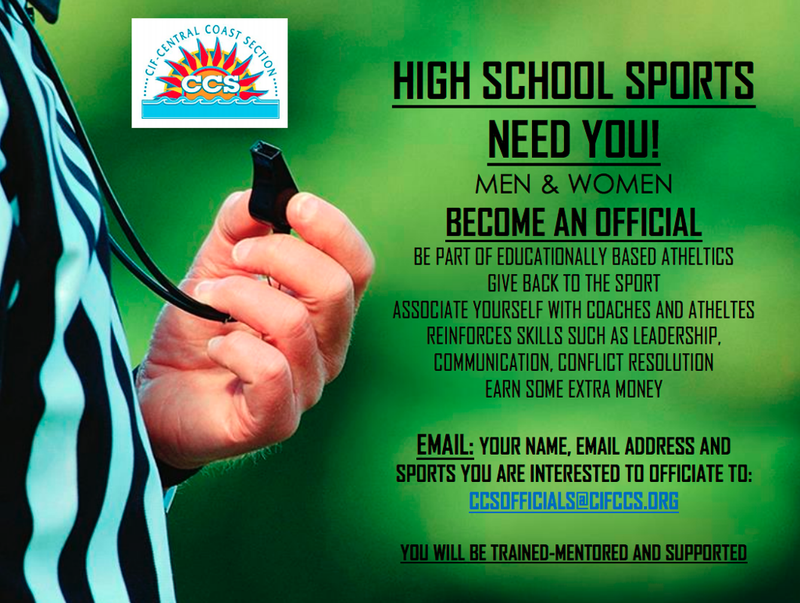 I would encourage anyone who is interested in officiating to contact their local officials organization to learn more. Stand tall and wear your stripes with pride. ©2019 Peninsula Sports / SportsEngine. All Rights Reserved.